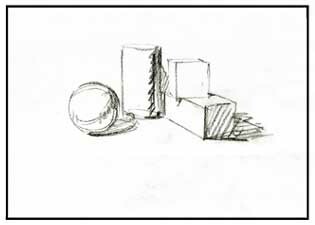 In this lesson you will practice drawing a still life using already familiar simple geometrical objects. Still life is an arrangement of several objects. The composition is an arrangement of elements of the artwork that unites the elements into one whole. Pay careful attention to the object placement inside the drawing from the beginning. There must be a balance between the drawn objects and the space around them. In other words, the drawn objects should not be too small or too big, "fall off" from the paper or be shifted to the left or to the right. 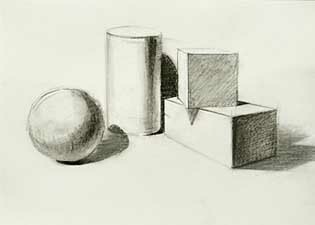 This is the first stage of drawing the still life. The next important part is the proportions of the objects. The proportion is the interrelation between two or more magnitudes. Notice the relations between the sizes of the shapes. Take time to measure the relations between the objects. Always work in parallel, the images should appear like on a Polaroid picture. Composition is a complex and important subject in painting and the examples below are in no way comprehensive. * Would moving the objects to the left/right/up/down make the image look more balanced? * Would "zooming in" or "zooming out" from the picture make it look more balanced? 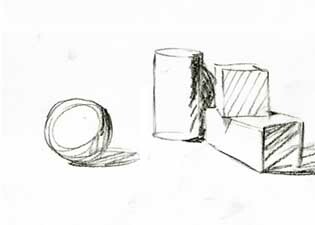 * Are the spaces between the objects balanced? Bad composition example, the objects are too small compared to the size of the paper.